The leaders of the BRICS (Brazil, Russia, India China and South America) met during the G20 summit and agreed to develop a consolidated position with regard to the economic situation in the European Union and a plan for overcoming the debt crisis. Georgy Panin of Rossiyskaya Gazeta spoke with Nikita Maslennikov, an advisor of the Institute of Contemporary Development, about the steps that the BRICS could take to help the eurozone. Maslennikov: To begin with, we should note that the European Union is an important trade partner for a number of countries. For example, for Russia it accounts for 50% of foreign trade and 45% of foreign currency reserves. Furthermore, Russian banks have invested more than 700 billion rubles in the bonds of European countries, and we haven’t even touched upon oil and gas supplies. The collective position of the BRICS is an argument for Europe not to waste time solving its problems. For the BRICS this is very important, and many questions are lacking coherent answers. How will the European Financial Stability Facility be funded? Through what mechanism will the exchange of Greek bonds take place in the writing off of debt? And so on… Europe needs to find quick answers to these questions – a stimulus and reason to move forward. Furthermore, the BRICS are ready to help materially as well. The first to start talking about this were the Brazilians back in September. But the problem lies in the mechanism for participating in the solution to the problems of the eurozone. Should it be bilateral or collective? And from the general picture we can see that the BRICS are inclined to resolving problems collectively. And this means that the provision of assistance by the BRICS to the Europeans will be done through the International Monetary Fund. And the BRICS can also provide assistance to Europe by beginning to coordinate the buyout of the bonds of problematic countries, in order not to shake up the market and to minimize the risks of all parties. RG: But it is not so easy to work up a collective position – disagreements and arguments are unavoidable. While consensus is being sought, the moment will be lost. And there isn’t much time… certain experts say the eurozone has no more than two months to think things over. Maslennikov: I think that arriving at a common position of the BRICS would elevate the status [of the group] to that of a real global player. So it’s worth a try. And I think that the countries are up to the task. Additionally, we should keep in mind that their possible common position is above all else a sort of specification of Europe’s plan. Right now that is the main problem. As the Europeans developing something that is more or less a political framework structure, which still has to be filled with substance. And there could be some hidden dangers here. The BRICS could become hostages once the 17 eurozone countries start done the path of filling their framework structure with actual substance. That is, hostages of decisions which the European have yet to make. And this is the main reason why the process could be drawn out and why agreements relatively nonspecific. RG: On what issues should we try to agreement first? And how do you envision this unified position? Maslennikov: What we are talking about here in fact is the beginning of the process of positions the BRICS as a geopolitical actor. It has already proven itself as an actor in the global economy, but it has yet to emerge as a decision maker in global politics. And its position on the eurozone will mark the beginning of this long and major process. In my opinion, there are four points upon which the BRICS should insist. Firstly, the European Union has not used all of its opportunities and resources for solving the debt crisis problems. Secondly, the EU needs to demonstrate that it is truly prepared to carry out its own decisions. Because we are getting an enormous multitude of declarations, but nothing has taken concrete form. Thirdly, in overcoming the debt crisis the Europeans needs to find a new balance between the state and private business. This first of all concerns banks. Ultimately, this is about the anti-crisis assistance that European countries provided to the financial sector in 2008-2010, which should be made up and paid back. And, fourthly, the BRICS’s participation in resolving the problems of eurozone countries will naturally depend on the responses to the first three issues mention above and, most likely, the BRICS will participate on a collective basis within the framework of the International Monetary Fund. So that is the start, as it has begun to emerge. The first bricks in the structure of a joint position. And further on elaboration is needed. If they intend to work through the IMF and on this basis provide assistance to the eurozone, then the mandate of the fund requires clarification. Because it is possible that its capital will have to be replenished, and that is already a collective decision of participating countries. The next point which could be used to bolster the positioning of the BRICS as a global political player is raising the effectiveness of the G20. Because the G20 is dominated by an economic agenda. And the BRICS themselves are highly concerned about the social consequences of the global crisis. This includes unemployment, new generations entering the labor market, food security and so forth. This is why the expansion of the G20’s agenda is in the interest of the BRICS. One point of particular importance in the development of this positioning is the rebalancing of global demand and redistribution of financial flows in the global economy, which implies serious and intensive international reforms. And I think that in this situation the BRICS will be the leaders. RG: Europe is expecting that China will provide money for the European Financial Stability Facility. On the eve of the summit a promise was made to in the future include the yuan in the currency basket of the International Monetary Fund, in other words it would have the opportunity to become a reserve currency. Do you think the Chinese will ‘take the bait’? Maslennikov: We should note that participation in the IMF basket does not necessarily automatically confer the status of a reserve currency. And I think that China today has much broader interests. It is much more in important for China that it be recognized as a country with a market economy. And China also needs to calm the fervor over its currency policy. RG: In general, does the yuan have a chance at becoming a reserve currency by 2015, as Western experts are predicting? Maslennikov: We see a trend toward a slowing of the Chinese economy. There have been some well-founded prognoses that in the next 12 months China’s GDP growth will slow to 7%. And Chinese exports are also on the decline. All of this is leading many of the ‘hotheads’ among Chinese politicians to call for a strengthening of the yuan. Nonetheless, there is talk about 2015. But two things should be separated here. If we are talking about a regional reserve currency, then this timeframe is quite realistic, as the yuan de facto already is a regional currency in the China-Southeast Asia free trade zone. For example, today one-third of trade operations here take place via bilateral currency swaps and more than half of barter operation are denominated in the Chinese currency. As far as a global reserve currency is concerned, then the yuan remains a long way away – the distance here is rather great. No less than 10-12 years. RG: Won’t this lead to competition between our countries? We also dream of making our ruble a reserve currency. 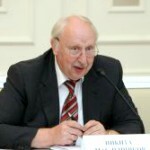 Maslennikov: I don’t think that there will be any competition here, as we have completely different realms as regional reserve currencies. For the Chinese this is primarily Southeast Asia, where as for Russia it is the post-Soviet economic space. Furthermore, competition is minimized when such financial instruments as a currency swaps are used. That is, mutual bilateral trade between our countries will primarily be transacted in yuan and rubles. The expansion of the framework of mutual swaps will, on the one hand, make it possible to minimize competition between the currencies and, on the other hand, strengthen the regional status of the yuan and ruble.